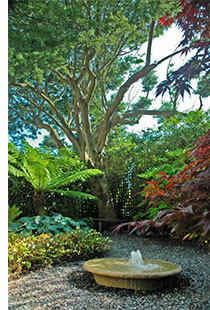 With the restoration of this Wicklow garden, several different garden rooms were created, including a lawn tennis court, kitchen garden, secret garden, and children’s play area with bespoke play equipment. Ample provision was made for entertaining with a patio and terrace on two sides of the house, both with vistas through to focal points linking the various garden rooms. 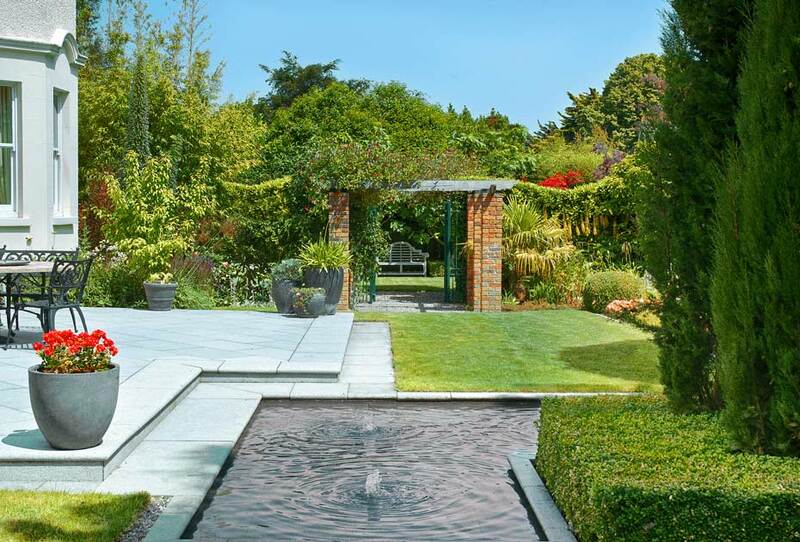 The large water feature and pavilion act as focal points in this country garden design. 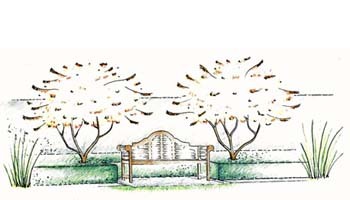 Some areas of the planting plan called for a more structured formal design, while others a more informal approach, each creating individual character and style. 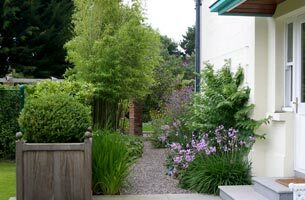 Formal and informal planting designs in this country garden design. 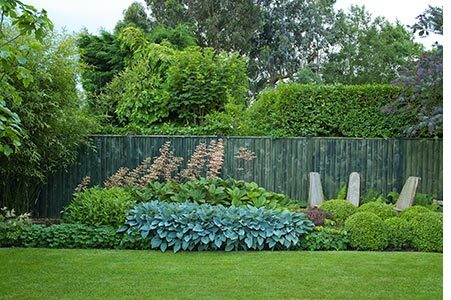 The period house and regular shape of the site called for a garden design with a strong sense of formality, while the various elements were linked together and defined by formal bay hedges and hardwood trellis screens. 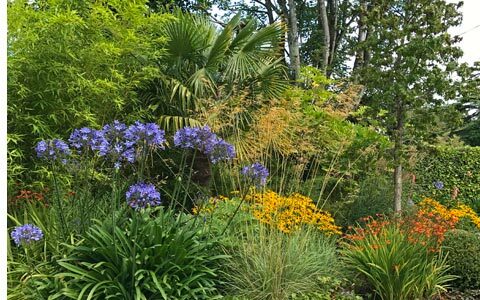 Different planting combinations were then used within the individual garden rooms to soften the formal lines and create an atmosphere of comfort, tranquillity and seasonal interest. There is a formal style to this terrace overlooking the tennis court. 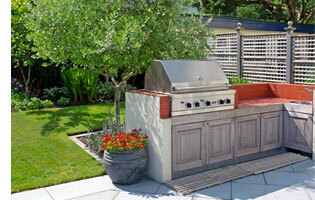 Container planting is used to soften and furnish the main elements within the landscape. In planning this family garden a lawn tennis court, outdoor kitchen and children’s play area were included to meet the clients’ needs. The wooden bespoke play equipment created for this project can be seen under “Treehouses and Play”. The clients also showed an interest in growing fruit and vegetables, so a potager (kitchen garden) was included to provide a seasonal supply of fresh produce. Fruit trees were espaliered to grow on the south facing house walls and container planting provided for a selection of Mediterranean herbs. 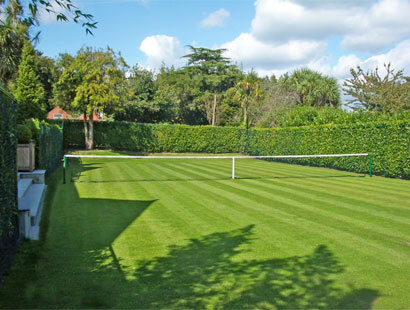 Tennis court (left) and the use of informal planting to soften the formal boundaries (right). A fully integrated irrigation system was installed with individual zoning to provide for the specific watering requirements of different areas within the garden. 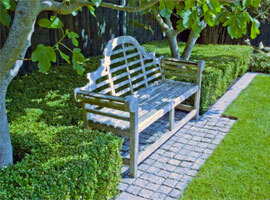 A combination of formal bench, specimen trees and clipped box planting produced a very strong focal point in the garden.